There is something about feet. Any feet will do. Actually socked feet are by far the best. Ask any self respecting ferret! Harry has a thing about feet and will go to any lengths (and I mean any) to get a nibble of a well socked toe. You have to warn folks who come in that the Carpet Shark may be about and to watch their tootsies. Now don’t get me wrong here, I’m not one of those ‘Take your shoes off at the door and save my precious white shag pile’ sorts. In fact we only have carpet upstairs and one rug by the fire, ain’t no carpet value in this here house missy, no suree! Round these parts people tend to travel about wearing the good old traditionally all-year-round foot apparel that best suits the Scottish climate – wellies. It’s just normal to kick them off at the front door and pad on into the house in your socks. Harry lies in wait. In fact I’m pretty sure he hears the front door from wherever he is snuggled down (drawers, beds etc) and leaps into frenzied ferrety action. Guests are treated to the unbelievably loud thunder-like rumbling that is the delicate pattering of tiny paws on the wooden stairs. Honestly you’d think there was a posse of ponies coming round the mountain, not one furry fella bounding down the stairs. He arrives with that gleeful smile that only a ferret can muster and goes into instant action in the foot department. ‘Ooch’, ‘Aaarghhh!’, ‘Help’ – we’ve heard them all from the most polite to the basically bracing. This is no toe-sucking-poolside-romantic gesture a la Duchess of York way back when, oh no, this is sink yer teeth in and cause havoc! My brother once danced round the kitchen on one foot with Harry firmly attached to the other. ‘Is that a furry piranha?’ he yelped, I had to marvel at Harry’s determination and sheer grit. Not only was he clinging on there, but my brother has been known since boyhood to have the smelliest socks in the business, how could Harry do this? Can’t he smell off-sock? Does he like smelly feet? We have come to the conclusion that it’s the latter. Harry gravitates to feet like red blooded men do to Angelina Jolie. It doesn’t really matter who the feet belong to. Harry isn’t fussy. He just likes feet and a nice woolly sock. So be warned if you come round for coffee, the Carpet Shark is on the prowl. 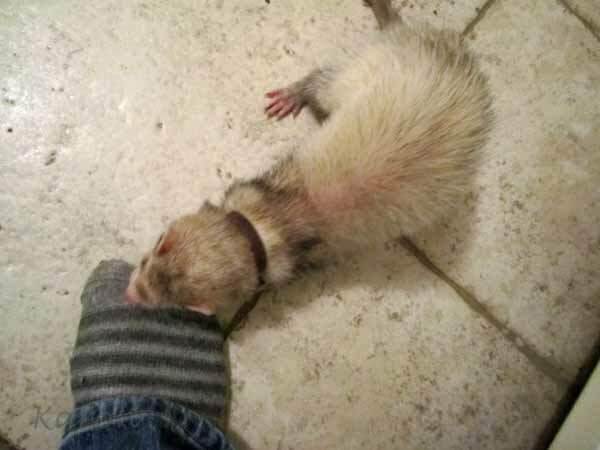 Ski sox, padded socks, they will help you not against this ferrety foot fetishist.